The University of the Philippines (U.P.) 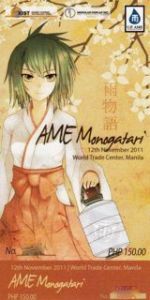 Anime Manga Enthusiasts is sponsoring a big event dubbed as “AME Monogatari“. This is an anime manga cosplay contest and fair happening in November 12, 2011 at the East Pavillion of the World Trade Center Manila, Philippines. For event information, see below. The event organizers are looking for event sponsors and booth renters. Interested parties may contact the management at marcom@up-ame.org or upame.monogatari@gmail.com. You may also visit the official website at http://up-ame.org/ or their Facebook fan page at http://www.facebook.com/event.php?eid=223931644305120. For the prizes and mechanics of the cosplay costume contest for either individual or group, please make your inquiry to the organizers or go to the official website of AME Monogatari I’ve mentioned above. The people this big event are also the ones responsible for previous successful stints like Una kAME!, kAME ulit!, AME Matsuri, AME Gakuensai, AME 8th Avenue, AME no Jidai and last year’s AME Track 10. Let’s cosplay!! !